I have a look at Mesen and I think the problem happens when sprites overlap and they have different background priority. When that happens Mesen will render that area by rendering sprites with background priority first, then render the background tile and finally render sprites with higher render priority. However these priority checks use the original ROM pixel instead of the HD replacement. In this game, the leg has background priority and has higher render priority than the item sprite. So Mesen renders the leg first, which is transparent in the HD replacement but Mesen looks at the original ROM pixel and thinks it is solid. Then it renders the background tile, which is also transparent, and finally Mesen finds that the item sprite has lower render priority than the leg and does not render it, because it thinks the higher render priority leg sprite is already rendered there. So Mesen does not render anything and leaves a leg shape void. The code is ugly and scarcely tested. You are welcome to report bugs. *I haven't had this specific kind of fun since mid 90s, when I made resident DOS map viewers for Eye of The Beholder I and II. Excellent - This is great because this type of map won't spoil the entire game for new users. But, it will keep track of where players have been. It shouldn't be too difficult to merge this with the master. Thank you! As far as an update goes - alternate graphics are currently in process (the main game is now complete with all new running animations - but not yet fully bug tested). The latest update for Metroid: HD is now available (Version 1.3). 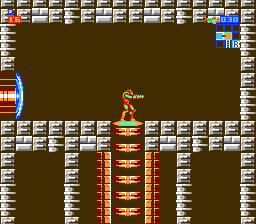 -The number of frames used for the Samus run animation has been increased (special thanks to KYA). -The jumping art for Samus has been updated (special thanks to mkwong98). -The "minimap" is now an "automap" (special thanks to KYA). -The download bundle now includes pre-assembled zip files for alternate templated graphics. -Altered art for Geega enemies. -The game now includes a small area that is new and secret. Hint - it is located in Brinstar and it will not be shown on the map. -The background in Norfair has been slightly brightened. -Blue face statues in Brinstar have been improved. -The death animation has been improved. -Minor modification to the automap "red dot." -Minor modification to title screen "explosion." -An alternate ice beam sound is available in the alternate "SoundEffects" folder. -New music for the Ridley and Brinstar areas is available in the alternate "Music" folder. Is there any way to do something about the map? Why wouldn't it keep scrolling when you hold the directional pad? You have to keep pressing the direction to scroll one room at a time. Annoying.. This makes no sense. The HD pack doesn't come with an IPS as far as I can see. Most of the map functionality is borrowed from snarfblam's hack and merged into this one. I'm not quite sure how to alter the scrolling behavior. But, if anyone is interested in taking this one on, I'd be happy to merge an upgrade with the master. Also, if you sort alphabetically, you should find the .ips file by looking for something called "mmm.ips." Could this be corrected or even incorporated into the project? Follow the download. The directions/instructions are included. Whoops, thought this was the developer, just keep that in mind when reading everything below (or ignore it if you want). I'm way too tired. 1. Only Brinstar's spriteset has been updated to feature the new HUD graphics. All the other areas' spritesets are unaltered, which is a bit weird, so you'd need to update that (which is pretty easy, it's just copy/paste on YY-CHR, and even then it's just a few tiles). 2. It screws around with the rocket graphics a bit, because the rocket icon it uses on the HUD is actually the same tile the lower half of the side rocket uses. You might need to edit the graphics pointers to make both look fine. 3. You might want to edit the layout of the HUD a bit to make it more comfortable, since it looks a bit too clumped together (pretty apparent it wasn't done/official). I can probably help you out on it if you need any (it's all in the game engine disassembly, excluding the minimap for obvious reasons). I could give you the addresses directly, but I'm pretty tired right now, maybe tomorrow. I already modified it with my own hack so I'm somewhat familiar with editing the HUD, even the x/y of the minimap itself. Of course, that's up to you if you want to edit it, obviously. If you think it looks fine as-is, then that's your choice. Either way, seems like a good idea. As for the glitch, I honestly can't tell. I'm assuming it's the E icon being replaced with the dots, but that seems like can be easily fixed with either graphics editing or hex editing, not gonna lie. Either way, this game is looking pretty good. Seems fun blasting away Metroids as Megaman X (that alone makes me wanna play it not gonna lie). This was more towards the developer but yeah. Yes, this can be corrected. In the HD pack, there are a number of .png files which contain the "dots." Chr_02_5 is one example. If you alter the appearance of the "dots" in each relevant .png file, they will reflect in the game as well. The dots are only used in the HUD, so changing them shouldn't cause issues in other areas. I use Photoshop, but many other programs such as GIMP would work well. Keep in mind that the dots change from blue to orange when selecting missiles. As a result, if you would like to retain this functionality, replacement graphics should behave in a similar manner. Also, keep in mind there will be different dots for each suit and each area (so multiple files would require adjusting). Also, early in the development of this hack, I did consider adding the on screen map feature you mentioned plus wall jumping (discussed at https://www.romhacking.net/forum/index.php?topic=24821.20). However, there were a few issues that I encountered. First, I felt that the map should be in the upper right hand corner of the screen (I see DannyPlaysSomeGames pulled this off) and the upper left HUD should be left alone as is. Also, I hadn't decided at the time if the graphics and colors of the map should be adjusted to fit better with the new HD aesthetic. I think the color of the yellowish square highlight bothered me most (although, I'm sure this can be adjusted with the HD pack functionality of Mesen). Lastly, after merging the changes, I found quite a few glitches beyond the "dot" glitch. I recall cut off missiles, a broken title screen, disappearing statues in the statue room, and blue doors in odd locations. Since first experimenting with it a few months back, quite a few changes have been made to the .ips file (such as the new automap feature by kya). As a result, the glitches could now be different. As the issues started to pile up, I started to realize implementing these particular enhancements without glitches would likely be a large project and I became more and more reluctant to pursue them. In fact, my significant other has made is clear for some time that they would like me to be done with this particular project As a result, I think I can take on small bug fixes and small updates. But, I may not spearhead any large changes in the near future. It sounds like this one may be one of those large undertakings. But, if the issues mentioned above were addressed, I would definitely be open to consider merging with the master. Also, it would be ideal if the alternate packs included in the download bundle were compatible with any future changes as well (FYI, Fusiontroid and Megatroid contain the same .ips file as the default pack, but 8Bit-troid has a different .ips file). Just wanted to pop in to say thanks everyone for all the hard work. This is the sort of project that makes me proud to be a supporter of RHDN. I love Zero Mission, but it certainly makes a lot of changes to the game and sometimes I just want to go back and replay the original, but the 2 frame animations and lack of map feature are definitely a difficult pill to swallow, so I'm really loving this project and all the excellent collaboration. I also just popped in to say thank you for this! I just played the whole game for the first time in years, and this is the only way to play from now on. One question thou; the whole Ridley fight flickers so much that it was a bit hard to see anything at all. Mod bug or original limitation? If it still flickers with the option on, that probably means the game has an internal sprite limiter. Removing that should make the Mesen option work (at the cost of removing sprites when used on the real hardware).